Based on a comparison of gold loan rates of all banks, SBI, HDFC Bank, Yes Bank, Andhra Bank, IndusInd Bank give the lowest gold loan interest rates in the range of 10.50% to 11.5%. Similarly, based on a comparison of processing fees, IIFL, Federal Bank, Andhra Bank are the best banks to take loan against gold as they charge the lowest processing fees of Nil Charges. Loan amount – This is the amount borrowed by the borrower from a bank. Generally, interest rate are high for smaller loan amount and vice-versa. Loan to Value Ratios - Banks charge higher interest on gold loan with high LTV ratio. Hence, higher the loan to value of jewellery, higher the interest rate and vice versa. Relationship with the Bank - Banks offer lower rate of interest on jewel loan for their existing account holders with a quick turnaround. Gold Loan Schemes can be categorized based on the purpose of lending. Banks usually offer lower rate of interest for agricultural gold loans which are offered to farmers and people engaged in agriculture for meeting their farming expenses. Non Agricultural Gold Loans: Loans extended to all other categories of borrowers excluding farmers and agriculturists are known as non agricultural gold loans. These loans are available to all individuals including salaried, self employed professionals, businessmen, women, females, housewives, students, retired officials who own gold and want to pledge the same to get loan. The features on non agricultural gold loans have been explained under the loan schemes by repayment options. Some banks allow a lower LTV of 65% on such schemes compared to maximum LTV of 75% on other loan schemes. Lowest EMI for a Rs 1 Lakh loan is Rs. 2,560 at the lowest gold loan interest rate of 10.50% and maximum tenure of 4 years. Gold Loan Processing fees – Most banks charges minimum processing fees of Rs. 1,000 to upto 2%. Some banks may also offer lower processing fees. 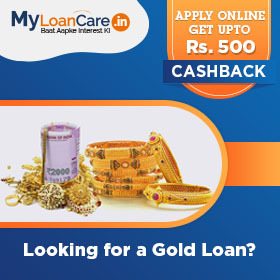 To get lowest fee, gold loan interest rate comparison, offers and cashback applying online through MyLoanCare. Gold Loan Prepayment and foreclosure – Nobody wants to keep paying interest on a loan when you have surplus money available to repay it. When you want to repay your loan partially before time, it is called part prepayment. In case you decide to pay the entire loan amount before time, it is called foreclosure. Banks typically levy prepayment or foreclosure charges in such situations and these can range from nil to even upto 1%. So, check carefully if the low interest rate gold loan you are getting comes with high prepayment or foreclosure charges. Some loans also come with a lock-in-period and cannot be repaid before time. Why do I need Gold Loan? These loans are usually taken for short term requirements. Generally, these are used for children education, marriage and other financial emergencies in the family. Usually rate of interest on jewel loan is relatively low as it a secured loan for banks and NBFCs. Easy loans with no income proofs and no CIBIL checks required. Also allows first time borrowers and borrowers with bad credit to get loans. What are the dis-advantages of taking a Gold Loan? We do not see any significant dis advantages of taking a gold loan except that you need to part away with your gold holdings and take them to the nearest branch of the lender for valuation and depositing it with the bank. RBI has specified strict guidelines for ensuring complete safety of your ornaments when they are pledged with a bank or a NBFC. In addition to this, for salaried employees working with reputed companies taking a personal loan might be easier and come at a low rate of interest compared to gold loan. How can I apply for Gold Loan? You can apply in several ways. You can directly visit the bank branch and meet the sales person, contact a loan agent or apply online at any bank or NBFC’s website. The facility of tracking your loan is available with the bank. 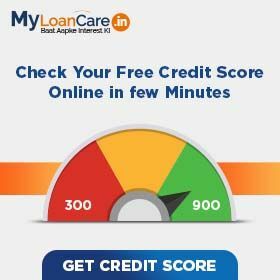 You can also compare gold loan interest of all banks online at MyLoanCare and apply for jewelry loan through our website. We will assign a customer representative officer to you who will assist you in the loan process. You will get a call from our customer representative officer within a few minutes of filling the application form on our site, who will assist you with rest of the gold loan process. Before applying for a gold loan, calculate your eligibility with online calculator. What is the Gold Loan process? You will be contacted by bank representatives who will explain the process, documents required and also schedule a convenient appointment for you to visit their nearest branch. Once your appointment is scheduled, you need to visit the branch with your jewelry. Your jewelry will be tested and valued by appointed valuers at the bank. If the jewelry passes the test and is in line with the specifications mentioned by you will applying, you will get the loan required. If the jewelry is found to be of lower purity or lower weight, you may be offered a lower loan amount. Also, remember that even if one piece of jewelry is fake, the bank may refuse to offer any loan to you. Once the jewelry is valued and loan amount is agreed and sanctioned, the bank will seal your jewelry in a packet in your presence and under CCTV recording. These packets are multi-layered to ensure complete safety of your ornaments. The jewels are than kept in bank safes in strong rooms maintained by the banks. The bank will simultaneously issue you a disbursement letter with loan amount and other details which have to be signed by you and the bank's representative. What will the bank do if the gold prices fall during the tenure of Gold Loan? In rare cases, if the borrower fails to make this payment, the gold can be auctioned after giving due notice period and multiple reminders to the borrower. How can I get the maximum amount of Gold Loan per gram? Specially minted gold coins of banks of up to 50 grams or 22 carat gold ornaments will offer you the best rates. If you offer hallmarked jewelry, you will be charged a lower processing fees and hence, your cost of loan will be lower. Lower purity gold ornaments of 18 and 20 carat will get your lesser amount of gold loan. Ornaments with a lot of other stones including diamond, pearls, ruby etc might not fetch you a good loan amount as banks deduct the weight of these stones to calculate the net weight of gold and hence, the loan amount you will be eligible for can reduce depending on the net weight. Avoid pledging your mangal sutras, as many banks as a policy do not accept mangal sutras as a valid mortgage, with the exception of few banks who accept mangalsutras without black beads as a valid security. What will the bank do in case I am unable to repay my Gold Loan in time? If any individual fails to pay his EMI, interest or principal repayment on time, he is sent a follow-up reminder by the bank. Banks also levy a late payment fees as penalty on the borrower. In case of genuine borrowers, the banks may also offer an option to extend the tenure of the loan or renew the loan facility. If the borrower fails to repay the loan in 3 to 6 months, he will be treated as a default customer and the bank will send him a legal notice asking him to pay his dues, failing which the bank has the right to confiscate the jewelry kept with them and auction it, if required. What is the minimum and maximum tenure of jewelry Loan? Jewel loans generally taken for shorter time period of less than 1 year.The tenure can range from 6 months to 36 months. Do I need to open bank account to service my jewelry Loan? Can I apply for Gold Loan jointly with my spouse? Yes, you can apply for jewelry loan jointly with a co-applicant (either be your spouse or your parents). Does it affect my co-applicant if I default on Gold Loan? Yes, if you fail to pay the loan on time then it will also affect your co-applicant as default in loan will affect his/her s CIBIL rating as well. Will banks charge extra fee if I fail to repay Loan on time? How much time will it take for me to get money? Generally banks and NBFC's offer quick disbursement of jewel loan within an hour of walk-in at specialized loan branches. MyLoanCare can help you connect with your nearest bank branch. Play safe with your valuables and visit the branch only after your appointment is confirmed by us. What are the documents required for availing Gold Loan? Who can access the customer online portal? All existing customers get access to customer netbanking portal by login their user id and password.